LOCATION.--Lat 41`23'22", long 77`41'28", Clinton County, Hydrologic Unit 02050203, on left bank on SR 4005, 0.3 mi downstream from Laurelly Fork, 1.5 mi upstream from Left Branch Young Womans Creek, 3.7 mi upstream from mouth, and 5.0 mi northeast of Renovo. PERIOD OF RECORD.--December 1964 to current year. 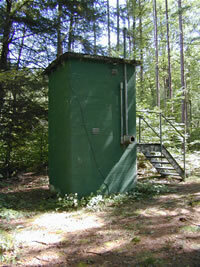 GAGE.--Water-stage recorder, water-quality monitor, and concrete control. Elevation of gage is 780.41 ft above National Geodetic Vertical Datum of 1929. Satellite telemetry at station.